Landscaping with rocks is the epitome of xeriscaping; succulents and other drought tolerant plants of all descriptions thrive in the crevices and crannies formed by mulching with rock mulch, which also has the added benefit of forming a cool root run. In an almost contradictory fashion, the mass of the rocks keeps the soil warmer so the roots can grow for longer in the fall. The sheltered environment in between the rock crevices provides a cozy spot for plants that require a bit of extra protection from chill winter winds, or late frost. Pay close attention and you'll notice that areas around a group of boulders bare off first thing in the spring because of the suns warmth on the rock. If you’re gardening in an area of cold winters and lots of snow, this will be the perfect spot to plant some choice early blooming rock garden plants or alpine plants for that first glimpse of spring colour. Bulbs of all kinds thrive in the protection of large rocks. Crocuses are a favorite spring flowering bulb. 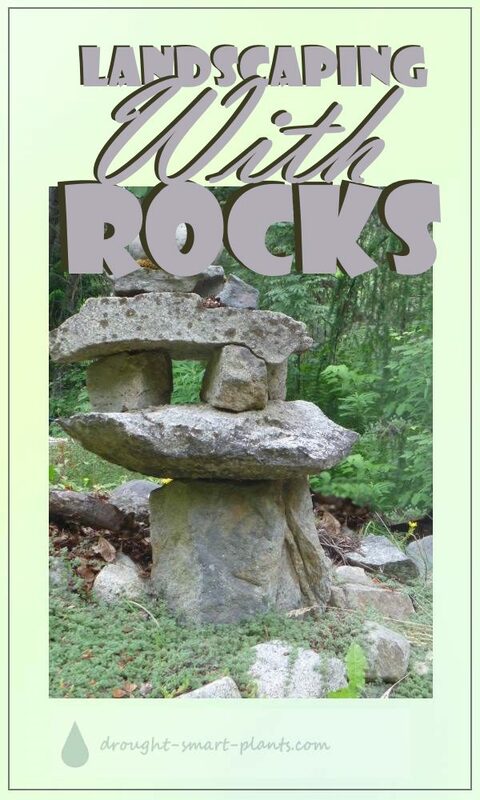 Landscaping with boulders can add an incredible depth and character to your garden. In many places, the trend has been to remove all semblance of uniqueness, making all gardens in the area blend into one another. You won’t have this issue when you start landscaping with rocks – each gardener or landscaper will have different ideas of how to use them, and all rocks are different. River rock landscaping utilizes the rounded forms of stones softened and tumbled by water, often contrasting these with more rustic and jagged forms. Japanese rock gardens offer even more; they are a microcosm of a larger landscape, from a mountain range to rushing tumbling brooks, the use of rocks to emulate nature in the garden is a way to venerate and revere her. In my garden I've got lots of rocks to choose from; glaciers once covered the land, scraping and rounding boulders and stones and giving them a smooth surface, and natural erosion provides some interesting flat rocks with a more rugged look. There are metamorphic rocks, sedimentary and conglomerate rocks, intermingled with the native granite bedrock. 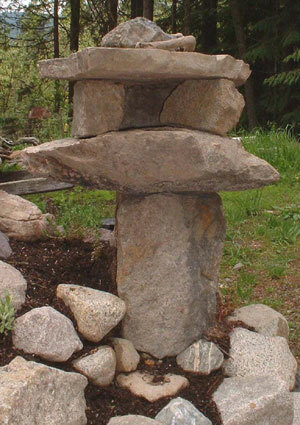 A rustic inukshuk or Japanese stone lantern will add ambiance to even a plain and otherwise uninteresting garden. Don’t be afraid to showcase the lovely patina and textures of unusual rocks, and encourage moss and lichen to grow on them by spraying with yogurt, buttermilk or sheep manure in water. Even a few well placed rocks grouped together and planted with some of my favorite hardy succulents such as Sempervivum and Sedum make a fantastic focal point; easy maintenance, low water requiring landscapes are easy with the bulk and mass of rocks. Rock retaining walls, stacked garden walls, rock gardens and crevice gardens will be unique and individual. 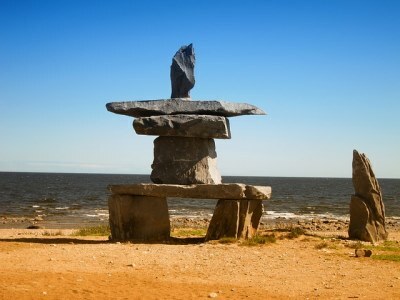 Landscaping with rocks gives the gardener and landscaper a way to make a statement, and the look of age makes rocks that much more impressive and solid. Please use caution and basic safety precautions when landscaping with rocks. Gloves and steel toed boots are the order of the day, as a finger pinched between two boulders will bring a quick end to your xeric garden projects. There are many ways to move rocks - I've tried them all! To move rocks that can weigh more than you do, use fulcrums or wedges, and if possible, get a good operator on a skid steer loader to move anything bigger than you can manage. I’ve moved rocks by hand, and guided a skid steer operator (or two) and a track hoe maestro to place the boulders for me. Guess which one is easier?